The Weekend Gourmet: Nolan Ryan Beef Holiday Gift Sets...Featuring a Fillet and Ribeye Combo Giveaway! 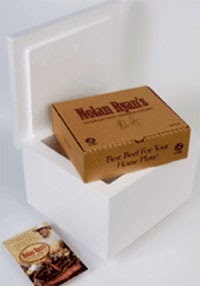 Nolan Ryan Beef Holiday Gift Sets...Featuring a Fillet and Ribeye Combo Giveaway! Some things in life are just a given…here’s an example for: Texans love their beef! Not any old beef, mind you…it must be 100% natural beef. One of my favorite brands of beef is Nolan Ryan Beef. Yes, that Nolan Ryan! In addition to being a Hall of Fame baseball pitcher, he also has a company that offers some of the best beef you can find anywhere. This Texas-raised beef is consistently juicy and tender, and it cooks up so nicely. My Texas readers can find Nolan Ryan Beef at select grocery stores around the state. If you live outside of Texas, no worries...they also offer convenient mail order. That allows people all across the country to give this great beef a try. Just in time for the holidays, Nolan Ryan Beef is offering a special discount code (BLOGGER05), which will save The Weekend Gourmet readers 10% off any purchase at their online store. Nolan Ryan Beef is offering some really fantastic gift sets just in time for the holidays, including the Hall of Fame Fillet and Ribeye Combo. This gift set retails for $69.99 and contains the following items: two 10-ounce ribeyes, two 8-ounce bacon-wrapped fillets, a package of fully cooked beef sliders, and a bottle of their signature steak seasoning. They recently sent me one of these combos to try out in my kitchen. As an added bonus, they’re also going to be giving one of these Fillet and Ribeye Combos to one of you! My package arrived at my front door in a Styrofoam cooler with dry ice, which ensured that my steaks remained frozen during shipping. Inside the cooler, each steak was individually cryo-sealed in a packing box to keep the freshness in. I was very impressed with the care they took with packaging my gift set! A couple of days later, we decided to grill up the fillets for dinner. I wanted the beef to be the star of the show, so I kept it simply elegant. I marinated the fillets in a jalapeno-garlic marinade that I like, then I cooked them medium using my cast-iron grill pan. They cooked up to juicy perfection! To stay with my spicy Tex-Mex theme, I served each fillet on top of a bed of Spanish rice. Then, I topped each fillet with a simple salsa of diced avocado, chopped grilled yellow onion, green onion, pomegranate seeds, lime juice and honey! It was an easy meal to prepare, but it was definitely fancy enough to serve company. The Nolan Ryan Beef fillets were definitely the star of the show. They cut like butter and had the beefy flavor that we love. Didn't it come out gorgeous?!?!? So...who wants to win some Texas beef? Nolan Ryan Beef is going to send one of you the very same Hall of Fame Fillet and Ribeye Combo package that I received. They’ll even ship it direct to your front door in time for the holidays! To enter this giveaway, simply follow the directions listed in the Rafflecopter below -- each person can receive up to FIVE entries. I’ll accept entries until this Thursday at 1159 pm CST, and the winner will be selected and notified on Friday, December 6th. Good luck!